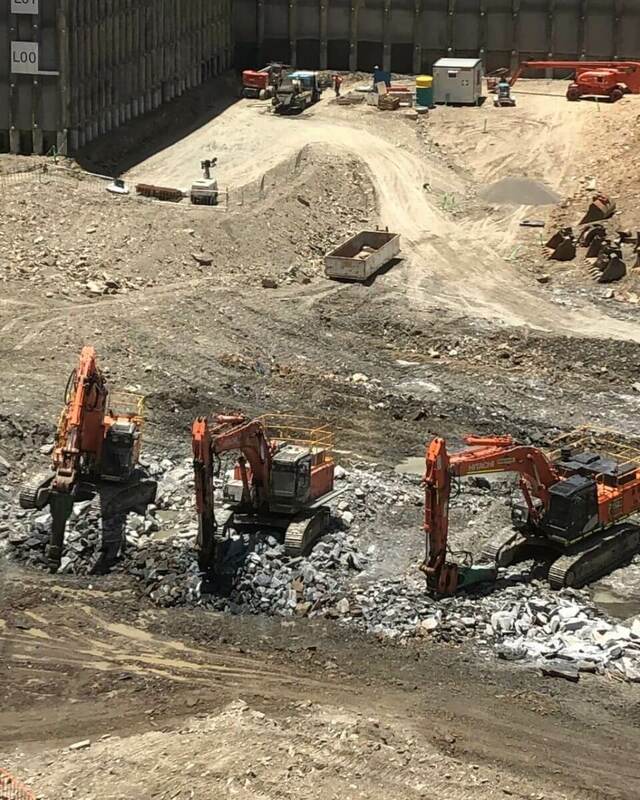 From December 2018 until July 2019, the hard rock encountered in the basement excavation will require cracking / blasting. Due to the extremely hard rock near the bottom of the basement excavation, it is anticipated that the rock will require cracking using a safe blasting method to be efficiently removed. This method will reduce the amount of hammering required to break the rock, thus reducing noise and speed up the time it takes to excavate the site. This is commonly used across CBD excavation sites that contain hard rock. Holes are drilled into the rock in a predetermined pattern, which are then safely filled with a small amount of explosive material. Each hole is then backfilled, and the area is covered with a heavy blast mat to ensure the blast is safely directed downwards. When activated, the materials fracture the rock into workable pieces so that they can be easily excavated. All activities will be carried out by a professional subcontractor that has prior experience with inner city blasting and the blast design and modelling is based on the previous blast test undertaken on site. A Blast Management Plan has been developed in accordance with the approved Structural Monitoring and Vibration Report which mitigates the impact on adjacent infrastructure and more specifically the heritage buildings surrounding the site. This has been approved by Economic Development Queensland. Between 6am and 8am on selected days between Monday 3 December 2018 and Wednesday 31 July 2019, ground vibration will be noticeable as low frequent thumps every half second for a duration of typically 10 seconds. It is currently anticipated that there will be a total of 20 events with a maximum of 3 per week depending on progress across the eight-month period. Noise, vibration, and airblast overpressure will be monitored as part of the controlled operations in accordance with the project’s Noise and Vibration Management Plans. Vibration monitors have been established to capture and analyse data and are located throughout the development site, including on and within the numerous heritage buildings in the precinct. Work to occur safely within the confines of the existing excavation site. Local exclusion zones within the site will be established and enforced by safety spotters.